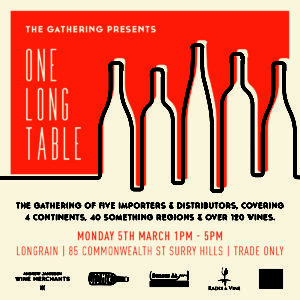 THE GATHERING OF FIVE IMPORTERS AND DISTRIBUTORS, COVERING 4 CONTINENTS, 40 SOMETHING REGIONS & OVER 120 WINES. RANGING FROM INTERESTING, WEIRD, QUIRKY, AVANT GARDE, TO CLASSIC AND TIMELESS STYLES. WINES WILL BE ARRANGED BY VARIETY TO ENABLE YOU TO ASSESS IN YOUR OWN TIME SPECIFICALLY WHAT YOU ARE LOOKING FOR AND COMPARE ACROSS THE LIST OF PORTFOLIOS.